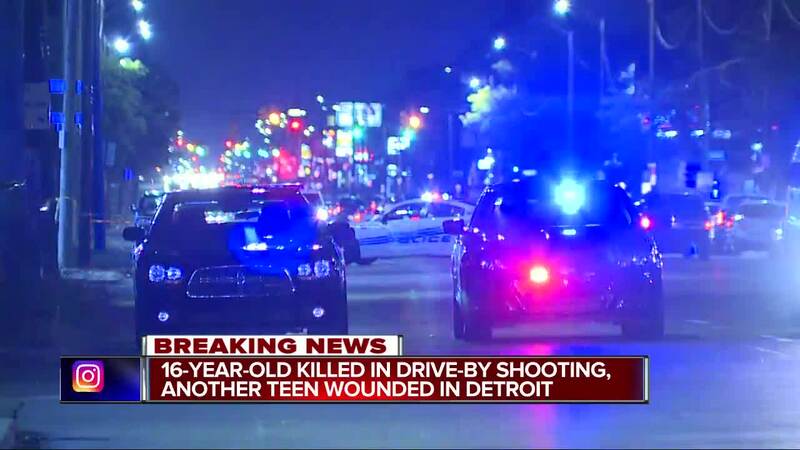 A 16-year-old has been killed and a 15-year-old injured in an apparent drive-by shooting on Detroit's west side. The scene is on Seven Mile Road and Pierson. Police say the situation began as an argument between a group of people and two teenage boys at a t-shirt shop. Police say the boys left the t-shirt shop and drove a short distance. Officers say the pair got a flat tire and pulled over to the side of the road. A car with a group of people inside drove by, and someone fired shots at the boys while they were changing the tire. It is not known if the group of people in the car is the same group of people that the boys argued with at the t-shirt shop. Police have released the description of two suspects in the case. The first is described as an African American man with a medium complexion with dreds and blonde highlights. The second is described as only an armed African American man. They were last seen driving northbound on Pierson in an older model red Chevy or Toyota. The 15-year-old is in stable condition at the hospital.